Marseille is the second largest city in France and is located along the Mediterranean coast. Its history dates back to 600 BC when it was founded by the Phoenicians. It is often seen as a melting pot of different cultures and ethnicities and has accommodated a large population of immigrants from North Africa. Since WWII, waves of Spanish and Italian immigrants have also flocked to Marseille. Today, it is a beautiful and lively city that has transformed itself from an industrial port with a reputation for organized crime and sleaze into a fashionable tourist destination. The natural splendor of the city is undeniable – ragged islands, fjords, beaches, and resort-like weather. 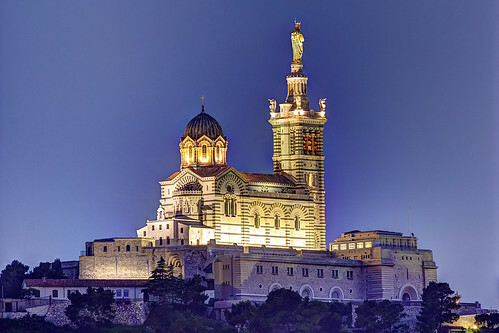 With its jumbles of white stone dominating the horizon of its seaport in the backdrop of neo-Byzantine churches, the picture of Marseille is definitely a pretty one – a sight of French Provence not to be missed. Marseille was originally founded in 600 BC by the Phoenicians as a trading port. The city flourished as a link between interior Gaul and the Romans, who wanted to import wine from the former. While the city cemented its status as a trading port, it eventually lost its independence around 50 BC and fell under Roman rule. After the collapse of the Roman Empire, Marseille was again subdued this time by the Charlemagne-led Franks; the city remained a major trading port, however, and continued to grow in prosperity until the mid-14th century when it was nearly wiped out by the Black Plague. In the 15th century, Marseille regained its prosperous status as a trading port in the Mediterranean. It was soon fortified by the Duke of Anjou and used by him as a base to conquer the Kingdom of Sicily. In 1481, Marseille became a part of France, but was never really submissive to the central government. This was quite evident during the French Revolution in 1792 when the city was one of the most prominent supporters of the cause. The revolution, however, came only 70 years after the city suffered its second medieval bubonic plague, which killed some 100,000 people. The plague instilled such fear in the rest of the French Province of Provence that an act of parliament in Aix levied the death penalty for anyone who interacted with someone from Marseille. A wall of dry stone was even built at the Mur de la Peste and guarded to prevent anyone from climbing over. The wall’s remains can still be seen today. In the 19th century, Marseille once again rose from the dead. The French Empire was at its peak then and many of its conquests and trade excursions embarked from the city’s port. Naturally, Marseille prospered as a result, a prosperity aided further by the stimulation of Mediterranean and Indochina trade following the opening of the Suez Canal in 1869. In the 20th century, Marseille ushered in waves of immigrants from North Africa. But the economic downturn of the 1970s caused by the oil crisis turned Marseille into a haven of organized crime. The city has since worked to rid this problem and has been on the rise of late, transforming into a center of technology. Today, Marseille remains one of the more vibrant, multiethnic, and dynamic cities of France. The heart of Marseille is clustered around the Vieux Port, which is an old harbor where fishermen sell their seafood by auction. South of the port, you’ll find monuments like the Notre-Dame de la Garde and Fort St Jean. North of the port lies the hilltop known as Le Panier. East of the port, you’ll find the North African quarter, which is next to the throughfare of La Canebière. In Marseille’s south, the city is filled with hidden ports and coves. Visitors should check out the Noailles market by the Noailles subway station; it is lined with Arabic and Indo-Chinese shops that give the market the feel of an Algerian bazaar. The Vieux Port, which is an old harbor where fishermen sell their seafood by auction, is also worth visiting. Other points of interest include Le Panier, the site of the original Greek settlement and the oldest area of the town. The Centre de la Vieille Charité monument in Le Panier hosts a number of museums and exhibitions. The Calanques along the coasts and the Chateau d’If are also popular among tourists. The Calanques are a collection of picturesque fjords or natural limestone cliffs – truly a breathtaking scene and a great place for eager hikers. The Chateau d’If is a small island made famous by Alexandre Dumas’ The Count of Monte Cristo and used to serve as a penal colony. Another popular attraction is La Canebière, the hub of the city – a grandiose boulevard that runs down to the port. La Canebière is a great trading area of goods such as suits, jeans, spices, and metals. Visitors should focus in on the various quarters and districts of Marseille such as Le Panier, Vieux Port, Rive Neuve, La Canebière, South Canebière, Centre Bourse, the Island of If, Longchamp, St Just Chartreux, Cours Julien, Corniche, and Montredon – each with its own set of attractions. The nightlife in Marseille is lively like any other big city in France. You’ll find everything from rock, reggae, and jazz concerts, to discos swarmed by young crowds, to live music venues and pub-style bars. More classy operas, symphonies, and orchestras are performed at the Abbaye St Victor in Rive Neuve and the Opéra Municipal in Vieux Port. The best waterfront beaches are probably found at Parc Balnéaire du Prado. This is a seafront stretch that is divided into a number of beaches, all open to the public and well-facilitated. The beaches range from sandy to gravel. The coast is rather rocky with many inlets, bays, grottos, and ancient shipwrecks, making it a very popular diving area. While beautiful on various levels, Marseille is still a somewhat dangerous city. Tourists are often targeted by muggers at night, in remote areas, and at the buses and metro in the evenings. You can protect yourself by going out in groups or carrying minimal cash and valuables.